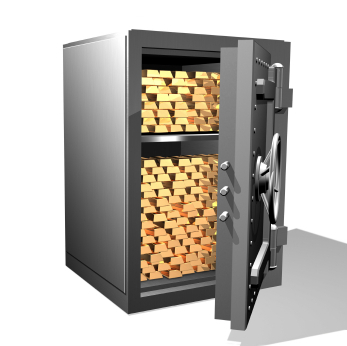 International Bullion Exchange > Resources > Why Own Gold? A common misconception today is that prices for goods and services have been going up. The truth of the matter is that prices have remained nearly the same in precious metals terms; it is the value of the dollar that has declined. It simply takes more and more dollars to buy the same products, since the dollar’s value has become worth less and less. When gold and silver were scrapped as a “control” mechanism for the US economy, the US began circulating a “robust paper” in place of real money. This “robust paper” is now the world’s reserve currency and the mainstay of central banks around the world. From 2002 – 2008, the U.S. Dollar lost over 60% of its value versus the Euro, and had similar losses against other major currencies. Since the dollar is the principal reserve currency for the world’s central banks, that means central banks have lost nearly 60% in the value of their holdings. It is no coincidence, therefore, that since year 2000, Gold prices have gone up over 350%.